World Stamp Album. A thin card-covered (colour illustrated) album, 64 pages, 170mm x 230mm. Pages printed in blue with simple country headings. World Stamp Starter Pack. Contains the World album listed to the left, plus a packet of 50 different world stamps, 100 stamp hinges, a little magnifier, and a pair of tweezers. This beginner's album is probably aimed at age range roughly 5 to 10, and would almost certainly be found very limited by an adult. The layout of pages is designed to fit an average mix of world stamps, as they might be collected by someone in the UK. This means that, for example, Great Britain gets one full page, while Guernsey shares a page with Guatemala, Guinea, and Guinea-Bissau. The main limitation of any fast-bound album is that once these pages are filled, you can't easily expand. This album, with every page filled, would hold well in excess of 1,000 stamps, but some pages will fill before others. 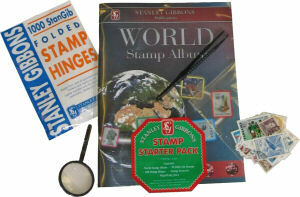 A good starting point for any younger child who has not collected stamps before.